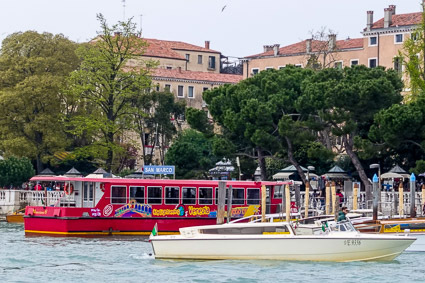 The "hop on, hop off" tour-bus company now serves Venice by boat, with half a dozen stops (including the island of Murano). 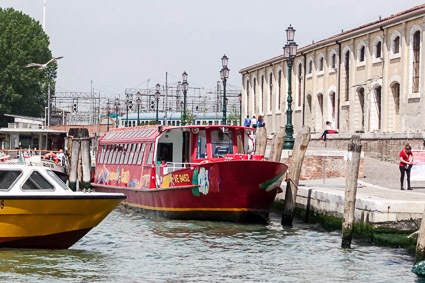 ABOVE: A brand-new City Sightseeing Venezia tour boat waits for passengers near Venice's Santa Lucia Railway Station. City Sightseeing is a familiar name in many European cities. It operates open-top sightseeing buses and local tours in European locations from Aalborg to Zürich. 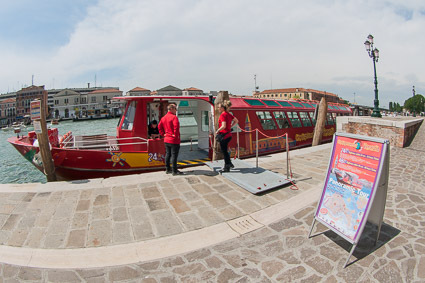 In 2016, City Sightseeing introduced a "hop on, hop off" boat tour in Venice. Unlike its defunct predecessor, the city's poorly-conceived Vaporette dell'Arte, City Sightseeing Venezia offers an easy way to reach many of the areas that typical visitors want to see, with access from the Santa Lucia Railroad Station and the Marittima cruise terminals. A 48-hour ticket costs €27 for adults or €13 for children from ages 5 to 15, with children under 5 free. You can join the tour at any stop. 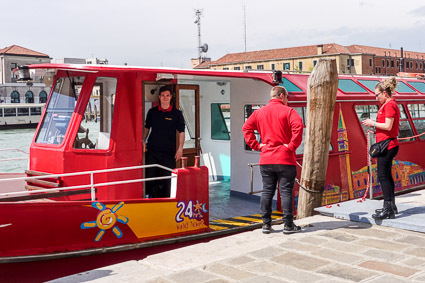 Tickets are available on board, from red-shirted company staff near the main boat stops, or from the City Sightseeing Venezia office in the railroad station. Is the tour worth the price? 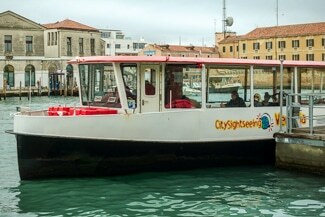 For about the same price as the City Sightseeing Venezia tour, you could buy a one- or two-day Tourist Travel Card from ACTV (Venice's transit agency) and ride frequent public water buses to locations throughout the city and the Venetian Lagoon. In contrast, City Sightseeing Venezia has only half a dozen stops, although these do include the most popular tourist areas, and boats run only about once an hour from morning through mid-evening. You don't need to figure out routes. City Sightseeing Venezia has a stop at the Marittima cruise basin, making it convenient if you're touring Venice from a cruise ship that's moored at Marittima. 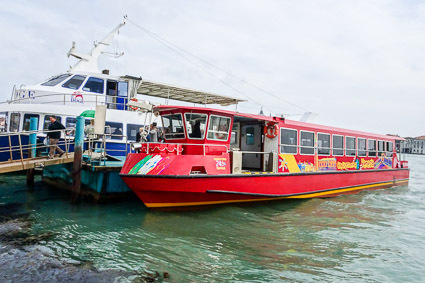 City Sightseeing's water buses have free Wi-Fi. 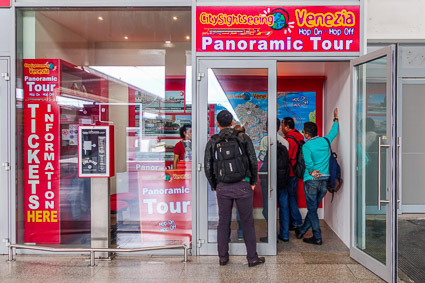 For more information about City Sightseeing Venezia, visit the company's Web site, where you can also download a free Android or iOS app. City Sightseeing Venezia tours begin and end at a landing just around the corner from the Venezia Santa Lucia Railroad Station. After you've bought your ticket, go through the station's side door. You'll see a sandwich sign and a portable gangway next to the water (and maybe the boat itself, as in this photo). The boat is a large flat-bottomed water bus that accommodates wheelchairs and strollers. If you don't have a ticket, you can buy one from a City Sightseeing employee in a red shirt or jacket. Tronchetto (a parking island). Service suspended in 2017. Stazione Marittima (the cruise basin used by large ships). Service on cruise days only. In this photo, you can see the City Sightseeing Venezia water bus cruising from the Lido di Venezia to the glassmaking island of Murano.